Christian Hoeld ​​was born in 1974 in Waidhofen / Thaya (Lower Austria) and lives in Langenzersdorf since 2012. His strong desire for drawing and painting exists since childhood. 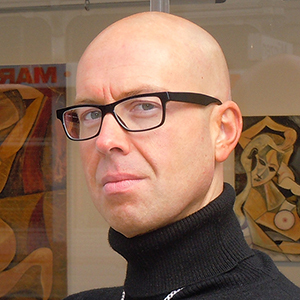 In 1994 he graduated from highschool in Waidhofen/Thaya with the main emphasis in Art Education and a specific focus on French Impressionism led by Prof.Mag. Franz Part. His early paintings in the 90s are chiefly inspired by this epoch. In 2004 the painter completed a course on “old masters” Technique at the Volkshochschule Vienna under Prof.Mag. Herar. In the following individual works arise and a personal internalization and spezification of this technique takes place. At the same time he worked on the wet on wet technique in oil painting. From 2005 to mid-2008 Höld ​​devotes himself to an intense study of sky illustrations inspired by the famous Dutch landscape painters of the so called “golden age” of the 17th century. The goal thereby was to create a most naturalistic depiction focused on the use of light and shadow, on the capture of perspectives, plasticity and spatial depth. In 2008 the artist discovers the Cubism and his varied possibilities as a new form of expression for himself. The break up of surface, space and figure into geometric forms and the reassembly in a new composition following an own inner logical systematology are getting to a central element for his subsequent work. The Analytic Cubism remains a constant to which he returns again and again. The continuous search for a further development of Cubism and the resulting expressions are characteristic of his creative process. Images arise of distortion and generate an own visual reality. For the painter it is of great importance that his works are strong in expression and represent his personal understanding of ​​aesthetics without taking regard to the public taste. Höld is, as he says, obsessed and in love with Cubism. Its continuation has become to a life-task for him. His paintings which usually arise out of his imagination have always a representational reference. The artist internalizes things seen in the real world and reproduces them in a modified shape by means of his typical style of painting. The degree of abstraction or distortion arises during and through the working process. The painting itself determines what happens next. That means the work on the painting is a dynamic process dominated once by intuition the other time more by a constructional component. Softness and hardness are in interaction. Höld deals in his opus also with figures and shapes, which – emerged from the constructional process – define new forms and induce associatively, so unreal they seem to be, a metaphysical connection to the human being. Other applied techniques: ink drawing, drawing, watercolor / gouache painting, acrylic. * Works of this kind will be published among others by little on this page, so stay interested!